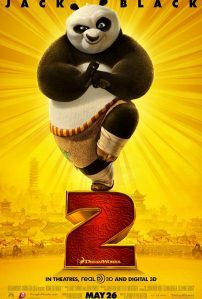 I loved the first “Kung Fu Panda” movie, which introduced the unlikeliest of action heroes-a funny, overweight panda named Po (voiced by a fabulous Jack Black), in a fresh and hilarious underdog tale. Let’s put it this way: I think it’s the best animated film to come out of Dreamworks Studios. Period. With that in mind, I couldn’t wait to watch “Kung Fu Panda 2”, and while it lacks the freshness of its predecessor, it’s still quite good, a particular compliment at this point in the movie season, since most of the films playing right now are either bad or instantly forgettable. I think a big part of the first installment’s appeal was the delightful mentor-student relationship between Po and his Kung Fu master Shifu (a terrrific Dustin Hoffman). And of course there was the novelty of giving our hero the opportunity to fight alongside his favorite warriors, also known as the Furious Five. Unfortunately, Shifu doesn’t appear much in this sequel, with the emphasis this time around being on a power hungry enemy named Lord Shen (voiced with perfection by Gary Oldman), and a parallel story in which Po searches for his real parentage (if you recall, he was raised by a noodle shop owner named Mr. Ping, who also happens to be a goose!). The result is a movie that is much darker in tone, but I think the folks at Dreamworks managed to pull it off. I, for one, was happy to go along for the ride, and at some point, I was even reminded of “The Empire Strikes Back”, which not only demanded that the audience recalls the events of the first film, but also took its story to a deeper level by involving our hero’s search for his true father. And by the finale, we understand that there’s still at least one more sequel to come. My seat is already reserved. But a lot of ppl told me that Hanna was pretty good! 😦 I still have to watch it ta chouf shu el wade3 :p haha but I really liked Kung Fu Panda! i loved it! so wobbley :p that panda can’t get up on his own hahaha, ahla men the 1st one and the 2D animation of his memories, just lovely! haha eh ktir byechbaho :p i loved the way it ended kamen. I bet the 3rd one will be as good as the first 2. And the 3D were pretty cool!